Mercedes-Benz is calling the 10th generation E-Class the most intelligent car in the world. As with other, equally bold statements from automakers about their latest vehicles, titles are rarely objective. That being said, the all-new mid range luxury sedan from Stuttgart ushers in some of the most forward-thinking technology ever seen on a production model. We’re still several years off regulatory approval for fully self-driving consumer products, but Mercedes-Benz has stretched the boundaries of semi-autonomous wizardry in a car you can buy next month. While most automotive brands trace aesthetic lineage noticeably between vehicles, Mercedes-Benz does so quite overtly. The ol’ “corporate face” finds its way on every new MB product these days, but it’s a delightful one to be sure. Therein, the 2017 E-Class looks precisely like an S-Class that’s been left in the washing machine too long, but gains 1.7 inches of overall length on its predecessor. The new midsize Merc works its flagship sibling’s curves just as confidently. Standard twin-beam LED headlights and taillights highlight the sedan’s dual-blade front grille and match a pair of trapezoidal chrome exhaust ports. Mercedes-Benz has always accentuated its vehicles with chrome without making them look ostentatious, and the new E-Class is no exception. Its front-lip, grille housing, window trim, door handles, rear diffuser, trunk latch, and aforementioned exhaust tips all receive the chrome treatment, but fit well within the luxury estate’s design. 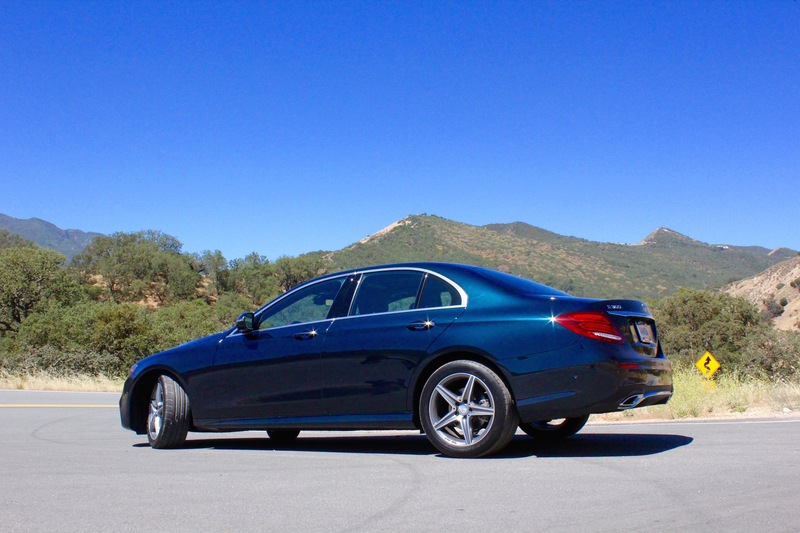 Each of our E300 test vehicles was equipped with 17-inch five-star wheels that are among my favorite MB designs. 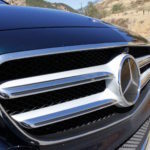 Rounding out the new E-Class’s most distinctive exterior cues is a lengthy hood, squat stance, and strong, arcing shoulder line from nose to tail. Inside, the stylistic architecture only improves. The interior’s blend of high quality materials, intriguing designs, and interface refinement take a visual lead over the competition. Wrap-around dash panels, dark wood grain trim, machined aluminum toggles and buttons, and fine leather check all the traditional luxury boxes, but each exquisite detail is overshadowed by a pair of incredible 12.3-inch digital displays. The two screens share a single, ultra-wide glass pane and function as driver instrument cluster and COMAND infotainment module. Though an analog gauge cluster with a 7.0-inch TFT display is standard, the second screen is worth every penny of its $800 upgrade. The term “high definition” doesn’t do these vivid displays justice; the resolution is absolutely stunning. Mercedes-Benz also introduces industry-first touch control buttons on the steering wheel that you swipe, scroll, and press-to-select just like an iPhone. Intuitively, the left control adjusts the driver display while the right controls the infotainment unit. For your actual smartphone, The E-Class is available with NFC (near field communication) charging and comes equipped with Apple CarPlay and Android Auto. 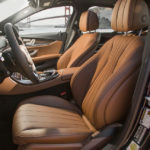 Those who appreciate personalization will also enjoy 64 ambient lighting options, which MB says isn’t just about looking cool, but also about pre-dilating the eye to adjust for bright exterior lights at night. Finally, an optional Burmester sound system is available with subwoofers installed in the driver and passenger foot wells to amplify sound and save in-door storage space. It’s hard to describe the sensation of cruising along in traffic, fully trusting that your car will come to a full stop on its own before slamming into the back of the leading car – it must be akin to how teenagers trust that the driving environment won’t alter while they look down at their phones. But of course, adaptive cruise control, even to a complete halt is nothing new these days (and neither, unfortunately, is distracted driving). 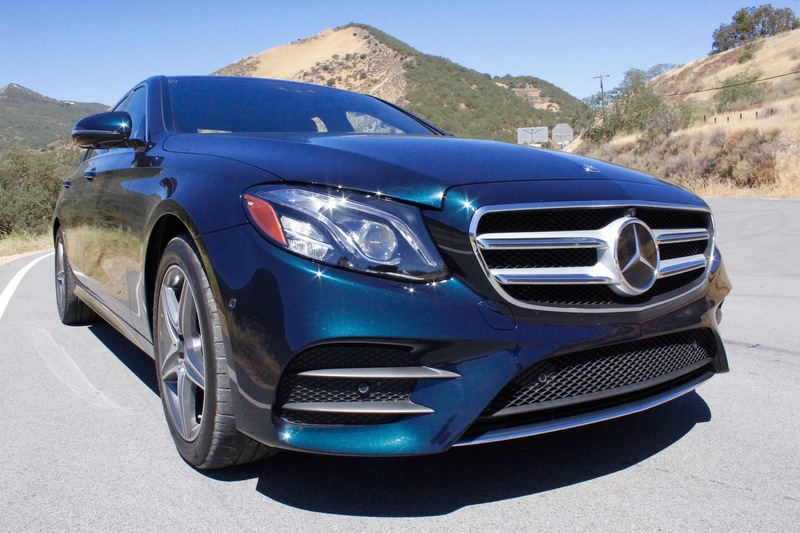 What is new, however, is a set of technologies Mercedes has introduced on the 2017 E-Class. Bundled within Drive Pilot Distronic is a slew of semi-autonomous features that MB says won’t just prevent accidents in distracted driving situations, but will also reduce driver fatigue and pave the way for fully autonomous tech in the near future. Though braking assist and rear cross-traffic alerts are seen elsewhere, front cross-traffic monitoring, lane changing assistance, and evasive steering assistance are ahead of the curve. 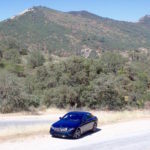 Only Tesla’s Autopilot comes close to the array of functions available for E-Class drivers, but is attached to a car costing significantly more. 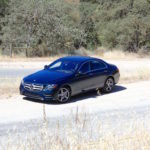 Loaded with sensors and cameras, the E-Class can initiate a lane change by simply activating the turn signal and choosing the right moment to pass a preceding vehicle or can automatically sense an evasive steering maneuver and apply additional steering force to the electronic rack. 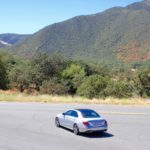 Perhaps most impressive among the automaker’s latest safety advancements is a pre-collision procedure that pushes the driver or passenger three inches towards the center of the cabin when the vehicle sensing an impending T-bone accident. 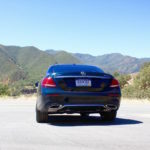 Mercedes says this not only moves the occupants away from the impact point, but also reduces injury related to abrupt force by jump-starting momentum. Simultaneously, the car will emit a “pink noise” through the stereo that initiates the body’s natural reaction to protect the inner ear canal. This noise can save a passenger’s eardrums from permanent damage. Though I was fortuitous not to experience these features during my time with the E300, the knowledge of their security was comforting. During the many, comfortable hours I spent behind the wheel, Drive Pilot proved to be a reliable traffic companion whom I longed to leave in charge of the mundane aspects of driving for longer than 30-second intervals (after which time my hands were required to return to the wheel). When the 2017 E-Class goes on sale in July, buyers will have a plethora of package and exterior paint options, but to outfit the entry-level E300 exclusively. 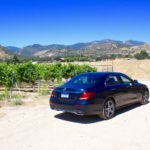 241 horsepower and 273 pound-feet of torque may not match the lofty performance attributes of the E43 AMG and its traditional sedan body may not offer the maximized utility of the E400 4Matic wagon – both of which will follow in early 2017 – but the E300 is not to be overlooked. 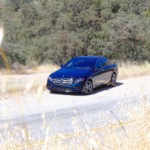 In lieu of a more potent (and heavy) six-cylinder is a 2.0-liter twin-turbocharged four-cylinder connected to a nine-speed 9G-Tronic automatic transmission with power available from 1,300 rpms. 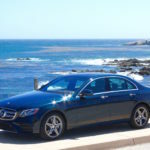 Mercedes has scrubbed 154 pounds from the 10th generation sedan’s platform, which doesn’t transform the E-Class into a lightweight sports car, but it does help the estate snake around corners with poise and agility. Mercedes has yet to announce EPA estimates, but I observed 33 mpg during varied driving conditions – a figure that could lead the segment. 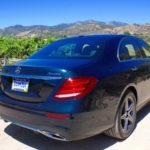 Though MB now sells more all-wheel drive (4Matic) models than rear-wheel driven vehicles, the engagement and cost savings of a standard E300 should not be missed. Along Monterey’s winding roads, the “world’s most intelligent car” didn’t let me forget it was an athlete before it turned brainiac. In the age of electric steering systems, earnest “feel” through the rack is too much to ask for, but to the E300’s credit, the sport wheel is both ergonomic and appropriately weighted through corners. It took a moment to adjust to MB’s multi-contour seats, which automatically bolster front passenger weight during cornering (or really any time there’s steering input), but ultimately I came to appreciate the added support. For the most out of Merc’s midsize, Sport or Sport+ driving modes sharpen throttle response, hasten shifts, and tune steering engagement. Conversely, the plushest ride is achievable through MB’s optional Air Body Control (air suspension). Of course, the base-spec E-Class has never been a targeted expression of performance, but this new platform, more than ever, will be an excellent foundation for the ensuing high output versions. The 2017 Mercedes-Benz E-Class will start at $52,150 (excluding a $925 destination fee), and while package pricing has yet to be announced, expect a well-equipped E-Class to retail for somewhere in the mid to high 60’s. 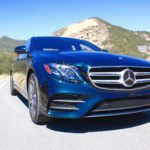 With the number of upgradable safety and convenience features on offer, in addition to a superb performance and efficiency baseline, rivaling luxury sedans will need far more than modest tweaks to keep pace with MB’s latest E-Class.